What Can Machine Learning Do for Open Education? One of the big promises of open and massively online education is easy data collection: we can record everything from students’ habits in reading and viewing lectures, to their participation in discussion groups, to their timing and performance on exercises. So, open education is a natural fit for machine learning—for example, we can use ML to predict future student performance, to select and sequence learning activities, and even to help grade some types of assignments. But there’s a lot more left to do: I’ll argue that even-bigger gains can come from ML that’s focused on understanding educational content and how students learn it, and on communicating this understanding to human educators. To achieve such understanding and communication, we need to take advantage of ML techniques including representation learning, structured learning, and exploration/experimentation. The 2014 OCW Consortium Global Conference will take place in the beautiful town of Ljubljana, capital of Slovenia, from 23-25 April 2014. OCWC Global 2014 is hosted by the OpenCourseWare Consortium and the Jožef Stefan Institute. Dr. Geoffrey J. Gordon is an Associate Research Professor in the Department of Machine Learning at Carnegie Mellon University, and co-director of the Department’s Ph. D. program. 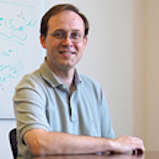 He works on statistical machine learning, educational data, game theory, multi-robot systems, and planning in probabilistic, adversarial, and general-sum domains. His previous appointments include Visiting Professor at the Stanford Computer Science Department and Principal Scientist at Burning Glass Technologies in San Diego. Dr. Gordon received his B.A. in Computer Science from Cornell University in 1991, and his Ph.D. in Computer Science from Carnegie Mellon University in 1999.